BMG has four of the top five albums in the US and three of the top five in Europe this week with chart-topping debuts from global superstars Santana, Foo Fighters and Rod Stewart and continued strength from Elvis Presley. 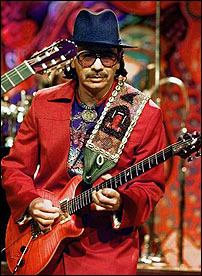 Santana's Shaman (Arista) debuted No. 1 in the U.S. according to SoundScan, and No. 2 on Music & Media's European Top 100 Albums Chart. Foo Fighters' One By One (RCA) debuted at No. 1 in Japan, UK, Ireland, Australia and No. 3 in the U.S. according to SoundScan, and No. 4 spot on Music & Media's European Top 100 Albums Chart. Rod Stewart's It Had To Be You … The Great American Songbook (J) debuted at No. 4 in the U.S. according to SoundScan. In its fifth week of release Elvis Presley's ELV1S: 30 #1 HITS continued its top-5 reign in territories around the world including in the U.S., where it holds the No. 5 spot according to SoundScan, and in Europe, where it holds the No. 3 spot on Music & Media's European Top 100 Albums Chart. BMG has also had a No. 1 album in the U.S. four out of the last seven weeks. Listen.com and Warner Music Group have signed a second non-exclusive agreement that will enable U.S. consumers to purchase and securely burn individual tracks from the extensive catalog of WMG-controlled recordings through Listen.com's popular Rhapsody digital music subscription service. Today's news builds upon the existing agreement between the two companies, which was announced in February 2002 when WMG licensed its controlled recordings to Listen.com for inclusion in the Rhapsody service. Subscribers to Rhapsody's "All Access" plan will also have the option to quickly and conveniently purchase tracks for 99 cents each and securely burn them to a CD-R. Using Rhapsody's intuitive CD burning software, subscribers can create custom CDs that can be played in any standard CD player. Rhapsody is the first online music service to give consumers the ability to burn tracks on a pay-as-you-go basis. "Rhapsody subscribers can already listen to the world's largest library of digital music," said Sean Ryan, chief executive officer for Listen.com. "Our agreement with WMG will now give them the added convenience of immediately buying music they've enjoyed hearing, choosing from tens of thousands of tracks from WMG's world-renowned artists. Today's announcement is an important step forward in how consumers access and listen to music through Rhapsody." "We're pleased to expand our relationship with Listen.com to provide consumers with more choices in how they access and purchase music from our world class artists and labels," said Paul Vidich, Executive Vice President, Strategic Planning and Business Development for Warner Music Group. "Rhapsody offers fans a unique way to experience their favorite music, and Warner Music Group is delighted to be working with Listen to give its subscribers the flexibility they expect from an online music service." Rhapsody remains the only service to offer music from all five major music companies — BMG, EMI Recorded Music, Sony Music Entertainment, Universal Music Group and Warner Music Group — in addition to music from more than 90 independent labels. WEA Inc., Warner Music Group's U.S. manufacturing, distribution and packaging operation, has named John Esposito to the newly created position of president. Reporting to WEA Inc. CEO Jim Caparro, Esposito will be responsible for overseeing the company's sales and marketing and branch distribution activities. Esposito comes to WEA Inc. from The Island Def Jam Music Group (IDJ) where, as general manager/executive vice president, he managed the company's day-to-day activities. He was one of the original architects of IDJ, and during his tenure, the company progressively increased its revenue and market share to become one of the industry's leading record companies. Caparro said, "Not only is John known for his solid team-building and people skills, but he's established a strong reputation as a leader and an innovator in the marketing and selling of music. I'm confident that his tireless energy and his unique combination of record label and marketing and distribution experience have made him ideally suited to address the unique challenges and the array of opportunities we face in the music business today." Esposito said, "No company is better positioned to transform the way music is delivered to the consumer than WEA. I'm honored to be on Jim's team, and thrilled by the opportunity to uphold the rich WEA tradition while looking to drive us into the future. I take the torch with a lot of pride and a deep sense of responsibility." Prior to IDJ, Esposito held a variety of executive positions at PolyGram, Inc. Before joining PolyGram, from 1993 to 1994, he was the chief operating officer of music and movies at The Wiz retail chain. From 1986 to 1993, Esposito was regional vice president-northeast division of Mitsubishi Electronics America, where he managed the sales and operations staff.